(Newser) – The Atlantic Coast Conference has followed the NCAA's lead and is removing all its athletic championships from North Carolina over a state law that some say can lead to discrimination against LGBT people, the AP reports. The ACC Council of Presidents voted Wednesday to relocate the league's championships until North Carolina repeals the law. The decision includes 10 neutral site championships this academic school year, which means relocating the ACC football title game that was scheduled to be played in Charlotte in December. No announcement was made on where the championship events will be held. The ACC was scheduled to hold 14 of its 21 championship events in North Carolina this academic year. The anti religious bigots are bullying people again. 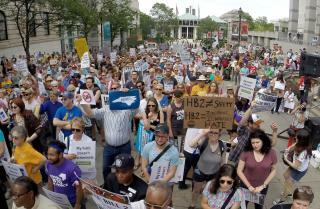 Keep fighting North Carolina! The fly over states need to quit being offended and start voting.! ""The decision to move the neutral site championships out of North Carolina while HB2 remains the law was not an easy one," said Clemson President James P. Clements" What a liar this man is. This is the same school that recently stopped a young man from praying, sitting on a bench on the school campus. They are at war against God and His people and His Holy Word. Foolish atheist. You're on the losing side.